Fastener buyers and end users are increasingly insisting on transverse vibration test, or Junker Test, reports compiled according to DIN 25201-4 B. This means the report on your fasteners must provide consistent and accurate data about the self-loosening behaviour of the bolted joint and locking mechanism under test. Test reports based on the old standard, DIN 65151, do not require a formal reporting format. That makes it difficult, if not impossible, to compare the performance of different fasteners testing in different locations and at different times. Alongside the requirements to use variable displacement and highly specified test fittings during a Junker Test, DIN 25201 describes in detail how the test results should be reported. The new reporting requirements may seem demanding when first encountered, but the benefits are considerable, not least because you can directly compare the Junker Test results of competing fastener products in a way not possible with DIN 65151. Furthermore, modern computer-controlled Junker Test benches, such as Vibrationmaster’s J-series, automate and provide templates for much of the reporting process. So far, the reporting requirements are straightforward. However, the Junker Test report must also explain how the test equipment has been constructed. This may prove problematic if the Junker Test bench is non-standard, and may invalidate the test results. But a test machine from an advanced Junker Test bench manufacturer will include a specification manual which will fulfil DIN 25201’s requirements regarding test rig construction. None of the above elements were required in DIN 65151 test reports; indeed, there was no prescribed test report requirement in the old standard. This lack of rigour made it difficult for engineers to compare the test results of different locking mechanisms with any degree of consistency. 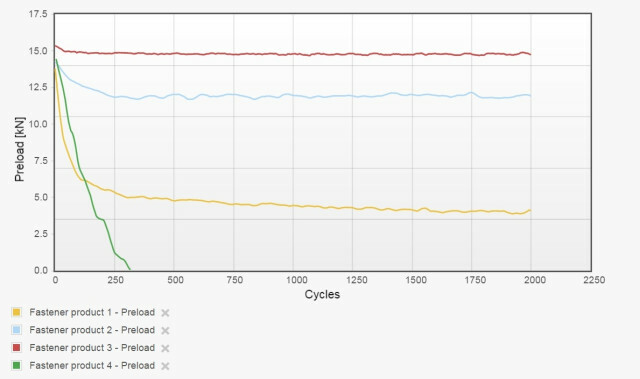 Time series data recording the preload against the number of load cycles is one of the most important elements of the Junker Test report. It allows engineers to compare the self-loosening behaviour of different fasteners and locking elements. And the ability to display multiple plots simultaneously to directly compare product performance is an incredibly powerful decision-making tool. Vibrationmaster’s J-series Junker Test machines include VM software as standard, to display the plot of the preload against load cycles in real time. The operator can also overlay several plots to compare different locking mechanisms, as shown in figure 1 below. For the purposes of a DIN 25201-compliant report, the data can be output to a number of common file formats for use in analysis and charting software and to display the time series data plot. Details such as lubrication, surface coatings and the range of diameters. Some models of Junker Test Benches, and many bespoke test rigs, will not be able to provide the level of test data detail required. And few can do so in a format that can be easily converted into a report format that meets the requirements of DIN 25201-4 B. But despite the additional work required to conform, DIN 25201 represents an important step forward for the fastener sector and its downstream consumers. 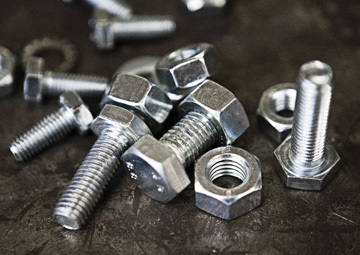 Original Equipment Manufacturers (OEMs) will have greater confidence when specifying fasteners that have been tested to, and shown to comply with, the standard. And fastener performance data can be exchanged in a consistent and comparable format between product developers and specifiers, improving product quality and safety. Contact us to find out how you can ensure your Junker Test results comply with DIN 25201.